A wire coat hanger, a brown grocery bag and puzzle pieces are the basic supplies in this Thanksgiving project. Although the puzzle pieces can be glued on with a glue stick, it works better and goes faster with a glue gun. Therefore this project works better with the older kids who can use a glue gun. The directions for this project, “Pilgrim Wreath,” is found in the Thanksgiving Projects Gallery in the sidebar. 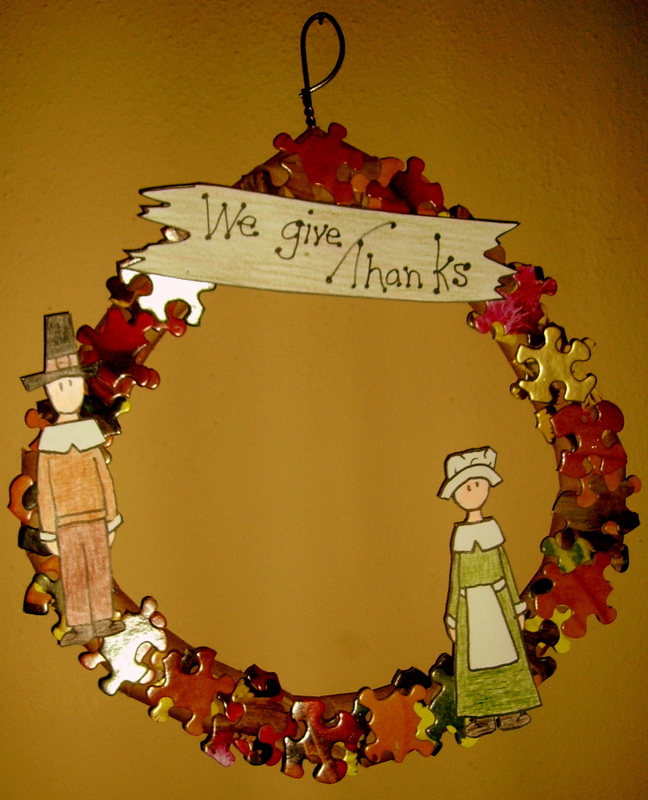 This entry was posted in Thanksgiving and tagged arts and crafts for kids, brown bag craft, brown grocery bag puzzle pieces, pilgrim wreath, puzzle pieces crafts for kids, puzzle pieces wreath, Thanksgiving, thanksgiving wreath, wire coat hanger. Bookmark the permalink.